OVERLAND PARK, Kansas - April 25, 2019 - Bushnell is excited to announce Ted Nugent has joined the slate of hunting and shooting celebrities to greet attendees in the booth at the 2019 NRA Meetings & Exhibits Show. Nugent will make an appearance and sign autographs in the Bushnell Booth (#4955) on Saturday April 27 from 1 to 2 p.m.
Nugent joins hunting celebrities Nick Mundt and Travis “T-Bone” Turner, as well as professional shooters Jessie Harrison, KC Eusebio, Maggie Reese-Voigt and Corinne Mosher. Bushnell will also be revealing several new product introductions (such as Bushnell's new laser rangefinders that offer two times the light transmission of competitive models) and drawing names for optics giveaways each day of the show. 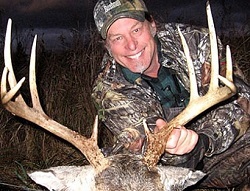 International rock star, 2nd Amendment advocate and hunting dynamo Ted Nugent has been a longtime Bushnell ambassador. The host of Outdoor Channel’s “Spirit of the Wild” Television Series will be signing autographs and taking photos with fans. He is known to millions of citizens as one of the nation’s most outspoken proponents of our first and second Amendment rights, and he conducts thousands of pro-gun, pro-freedom, pro-America interviews in major media worldwide. He has served continuously on the Board of Directors of the NRA since his initial election in 1995. Nugent is dedicated to preserving our great outdoor heritage for future generations, and along with wife, Shemane, regularly hosts hunts for sick and terminally ill children with Hunt of a Lifetime, Hunt for a Cure, and via his own Kamp for Kids. In addition to the Nugent meet and greet, attendees who visit the Bushnell booth will have multiple chances to win free optics. Visitors can also test out product performance in a new, one-of-a-kind Low Light Challenge. Before or after these appearances and demonstrations, attendees are free to check out the new product displays and get their hands on the latest models from the PRIME, NITRO and FORGE lines of hunting optics and the high-performance AR Optics, Tac Optics and Elite Tactical product assortments. As an added bonus, Bushnell will also be selling products and conducting “Show Specials” in the booth for consumers who want to get their optics without a wait.